Another early suspected influence on the reaction to the apparitions at Medjugorje was the ruling communist government. Ironically, it was the Bishop who initially supported Medjugorje, while the key Franciscan Father Jozo Zovko, OFM, was not convinced until, while praying in St James church, he received a message to "protect the children." Subsequently, both were called in by the communist secret police who gave orders to stop the "disorder," claiming it to be a counter-revolution. Father Jozo refused and was sent to jail for three years, but was released after serving half his sentence. After a period of silence, bishop Pavao Zanic actively joined in challenging what was happening in Medjugorje. He wrote two statements which he sought to have distributed worldwide, as well as edited two written statements directed worldwide as well: "The actual (unofficial) position of the Episcopal curit of Mostar in reference to the happenings of Medjugorje," of October 30, 1984, and "Medjugorje, 1990." The Catholic Church still does not hold an official position for or against the supernatural nature of the facts of Medjugorje, possibly waiting for the end of the apparitions. 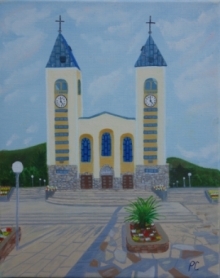 However, many believers and religious leaders (including Bishops) are coming from all the parts of the globe to Medjugorje, which has now received, depending on the sources, twenty to over forty million pilgrims and, according to the same sources, has now become the main Shrine of Christianity. Many Bishops are backing the authenticity of the claims about Medjugorje, including the Bishop of La Réunion, Monsignor Gilbert Aubry and the Bishop of Split, Frane Franic. Three medical committees also claim to have proof and evidence about the supernatural origin of the facts happening in Medjugorje. On the other hand, the current Bishop of Mostar, Monsignor Perić, however, claims that there is no evidence for the supernatural in the phenomena of Medjugorje, holding the same opinion of his predecessor, Monsignor Zanić. Catholics may go to Medjugorje. Such pilgrimages may even include priests acting as chaplains, as opposed to officially sponsoring them. Also, the Church has not suppressed discussion of Medjugorje, therefore, it is allowed. Common sense, however, says that Catholics on both sides of the Medjugorje issue should exercise prudence and charity in speaking of others who believe differently. Medjugorje is not a litmus test of orthodoxy, though every Catholic will have a moral obligation to accept the judgement of Rome, in the manner Pope Benedict explained, should it ever be rendered.